To complete its IP intercom offer, CASTEL has developed a new range, CAP IP: the widest range of audio video IP intercom stations compliant with disability regulations. - Intercom stations are available in colour video camera version, allowing to visualize disabled people who wish to access the building. - They have pictograms viewed with coloured LEDs and / or directly on graphic screen to indicate the call, the communication and the door opening. - These three steps are accompanied by audio messages. CASTEL goes further, with: - An induction loop directly integrated to the intercom station, optimizing communication with people equipped with hearing aids. - The keypad equipped intercom stations have buttons with Braille. 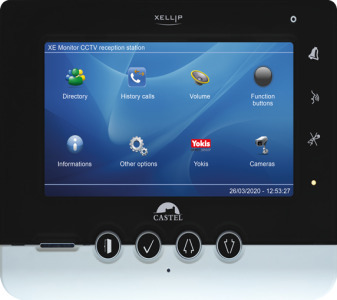 The latest addition to the XELLIP range of intercom access and audio video products, the XE-Monitor features a 7” TFT touchscreen. As a full-IP solution, the monitor maximises user convenience by allowing remote observation and operation from any Internet browser through an embedded web server. 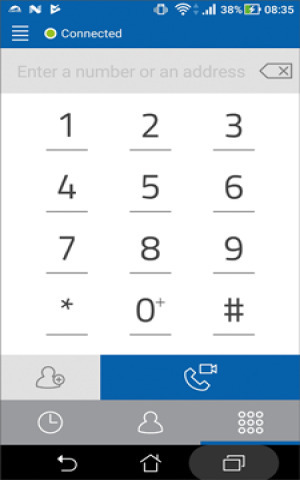 Make your intercom system easier with Castel Sip App, Smartphones and tablets solution.